14 3/4 by 20 3/8 in. The exciting discovery of the finished study for The Grain Sifters is certain to shed new light on Courbet's working methods. Courbet painted The Grain Sifters (Les cribleuses de blé) for the 1855 Paris Exposition Universelle, where it appeared side-by-side with ten other works by the artist. This was the same year that Courbet installed a separate exhibition of forty paintings in a near-by building, the Pavillion of Realism, built on the Avenue Montaigne. Both exhibitions took place over the summer months of 1855. 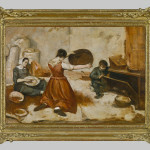 During the time when the final version of The Grain Sifters was on view at the Exposition Universelle, a very interesting and, somewhat unique, auction occurred at Drouot in Paris on June 27, 1855. It was titled, D'Esquisses Terminées de Tableaux de l'Exposition des Beaux-Arts. This sale was made up of 90 lots by 64 different artists; among the roster of names (many of which are unknown today) were Doré, Diaz de la Peña, Harpignies, Jongkind, Troyon, Toulmouche, Picou and under numbers 18 and 19 were two esquisses by Courbet, Les Casseurs de Pierre (The Stone Breakers) and Les Cribleuses de blé (The Grain Sifters). The theme of this auction was to bring together the oil sketches that corresponded to the paintings on view at the Exposition Universelle. There were landscapes, genre subjects, mythological, religious and history themes; in other words, the organizers of the sale appeared to have intentionally selected a variety of subjects represented in the 1855 Salon. 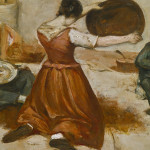 The motivation for this auction and the choice of artists featured remains unknown, however, the most important fact that has now emerged was that Courbet appears to have followed the traditional process of planning the final composition and color choices on a smaller scale before tackling the final painting. We rarely see preliminary oil sketches by Courbet – this just was not the way he painted, so we must ask ourselves, are these two works unique in Courbet’s oeuvre and if so, why did he do them? We can only speculate. Was Courbet asked to submit two esquisses for this auction, which meant – even if this was not his normal practice – he now would have to paint them? 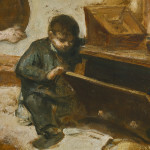 Or, did the organizers just assume that all of the Salon artists had esquisses of the final compositions in their studios and could simply open a cupboard to find one for the auction, and if this was not the case with Courbet, did he initially agree to be included in the auction and then paint two esquisses "after" the originals. Certainly his documented interest in self promotion (and interest in selling his paintings) would support either theory. 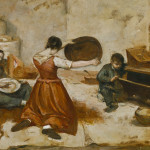 The next record of an esquisse for The Grain Sifters appears in an exhibition in Le Havre in 1858 where it is listed under Courbet's name: no. 127 – Jeune fille épilant du blé – esquisse des Cribleuses. While this 1858 show is cited in the catalogues of the 1977 Courbet retrospective (Paris, p. 135 and London, p. 120), at that time, the authors did not have any knowledge of the existence of a sketch. And, Francis Haskell in a 1975 article devoted to the subject of English taste for French art (Haskell, p. 76) mentions that Courbet's Cribleuses de blé was included in an 1859 exhibition at the French Gallery in London. Haskell rightly understands that this reference refers to The Grain Sifters, or a variant of it. Sarah Faunce believes that the French Gallery exhibition more probably included the esquisse and not the final version of the painting, as has previously been assumed. Courbet is known to have loaned the large painting to Brussels in 1857 and to Besançon in 1860, which were two extensive and important shows. 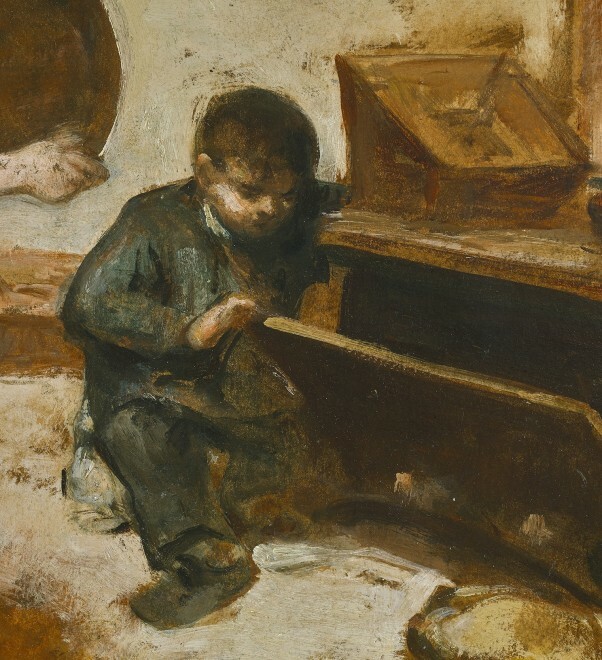 It is more likely, according to Faunce, that although we cannot document the results of the 1855 Drouot sale of Esquisses Terminées, that the esquisse passed into private hands and subsequently was shown in Le Havre in 1858 and at the French Gallery in London in 1859. Our esquisse is painted on cardboard, which is an unusual support for Courbet. However, Bruno Mottin, in his essay in the catalogue for the recent Courbet retrospective comments that out of all of the Courbets he evaluated in French collections, only one is on cardboard: The Portrait of Madame Andler (RF 168) (Bruno Mottin, " A Complex Genesis: Courbet in the Laboratory," Gustave Courbet, exh. cat., Paris and New York, 2007, p. 71). Interestingly, Madame Andler dates to 1855, the year of our esquisse, and the dimensions are almost identical. In a letter to Champfleury in late 1854, Courbet refers to The Grain Sifters as a "painting of country life...It belongs to a series of The Young Ladies from the Village, also a strange painting." (Petra ten-Doesschate Chu, ed., Letters of Gustave Courbet, Chicago, 1992, p. 133, letter 54-8). The setting for The Grain Sifters is a bluterie, or bolting room in Ornans. It has previously been assumed that Courbet's two sisters, Zoé and Juliette, and his illegitimate son, Désiré Binet posed for the picture (Gustave Courbet, exh. cat. 1977, p. 134). When compared to the final version of The Grain Sifters (fig. 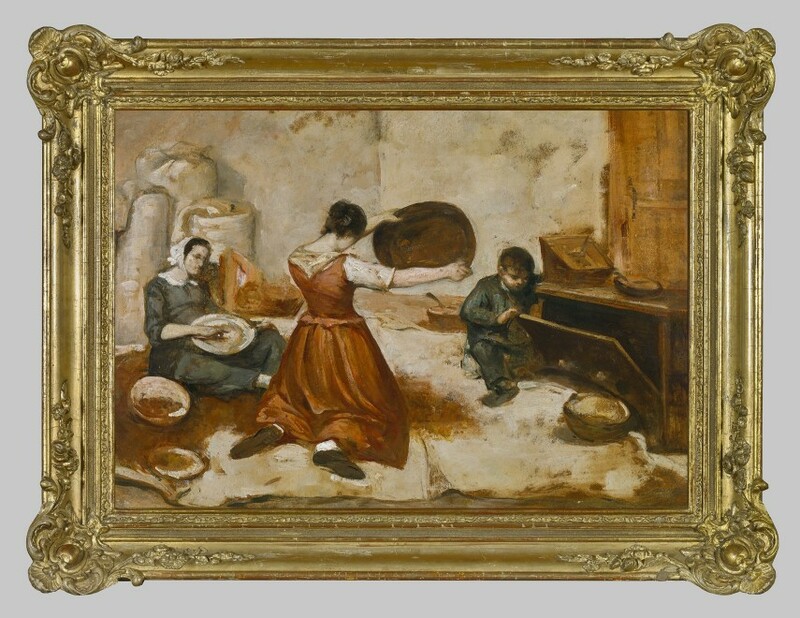 1), the esquisse conveys all of the characteristics associated with the development of what might be called the last step leading to the finished product. In the esquisse, Courbet has decided upon the composition and placement of the figures. Color choices have also been determined. What Courbet still has yet to refine in the finished oil are the specific gestures and attitudes of his sitters. The most noticeable differences are in the figures flanking the woman sifting. 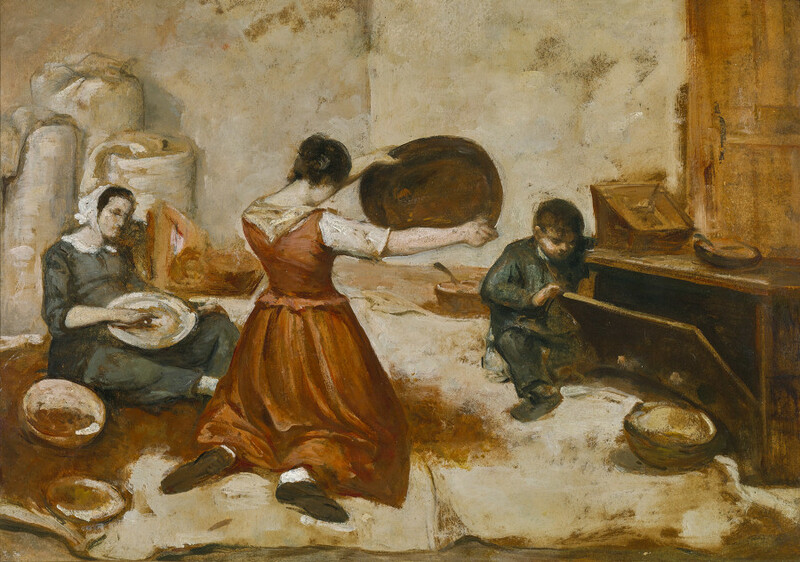 While they both appear in each painting, Courbet has refined their expressions and actions in the final work; the seated woman is more attentive to the task at hand but also appears to be daydreaming, and the young boy becomes much more inquisitive as he peeks into the tarare, or device for cleaning grain. What remains the same are such tiny details as the delicacy with which the seated woman picks up one kernel of grain with her fingers; this subtle gesture is expressed identically in the esquisse. But most remarkable of all is that the monumentality and strength of the woman sifting is as powerful in our smaller version as it is in the finished oil: knees pressed to the floor, strong, exaggerated outstretched arms sifting the grain, and one straight line from her left hand to her neck revealing no profile or facial features, underscoring that the peasant class is a faceless class. 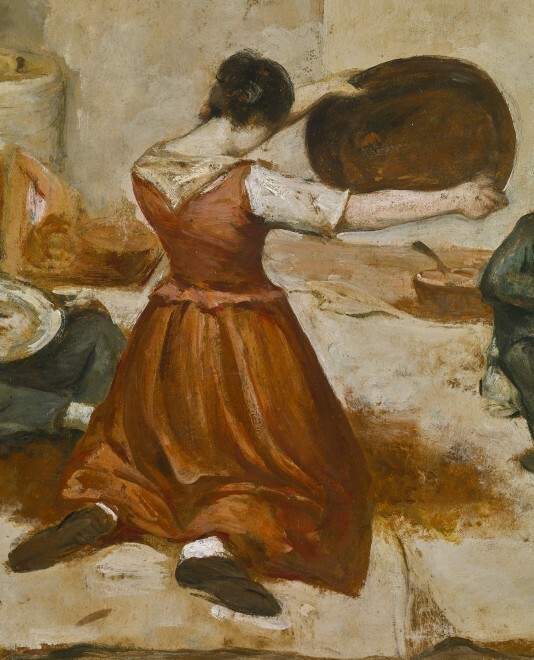 Courbet has taken some artistic license here as the traditional pose for a peasant sifting (male or female) is in a standing position; the weight of the sifting box would have been too heavy to maneuver while seated. The 1855 sale at Drouot also included an esquisse for The Stonebreakers. Based on the spontaneity and implicit monumentality of the esquisse for The Corn Sifters, we can only imagine what the equivalent painting for The Stone Breakers must have looked like. This painting was examined and authenticated by Sarah Faunce in 2008. Ms. Faunce also provided valuable assistance in researching the history of the esquisse. The authenticity was also confirmed by Jean-Jacques Fernier in 2007.